If you thought parts of the Commonwealth were insular and scary, just wait ‘til you take a trip to Far Harbor. 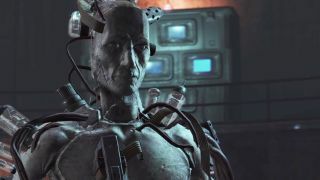 Bethesda Softworks showed off the upcoming Fallout 4 DLC in a moody trailer and revealed that it's headed to all platforms on May 19th. Children of the Atom cultists, hidden mutant anglerfish, a heavy fog that's made of equal parts water vapor, confusion, and radiation - this northern settlement has plenty of troubles of its own. And that's not even taking whatever nasty business that wired-up synth at the end of the trailer is getting into. Get comfortable in the cold and wet, since Far Harbor's new land mass is even bigger than The Elder Scrolls 4: Oblivion's massive Shivering Isles. Far Harbor will be released on its own or as part of the Fallout 4 Season Pass. Mod support will start going live on consoles around the same time, so you can look forward to even stranger adventures starting soon.